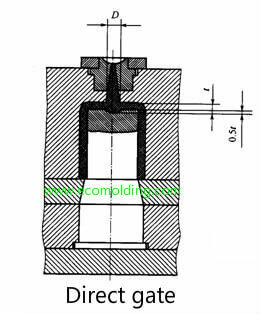 1.A small opening between the runner and the mold cavity, of which the location, quantity, shape and size, etc. 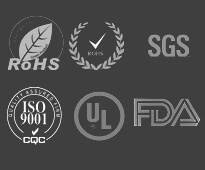 have a direct influence on product appearance, dimensional accuracy, physical characteristics and injection molding efficiency. 2.The size of an injection molding gate is dependent on product weight, material properties and gate shapes. The length, depth and width of a gate should be minimized on condition that product mechanical performance and molding efficiency can be guaranteed. 3.If the gate is too small, product defects like insufficient filling, shrinkage, sinking and weld lines will tend to occur, and molding shrinkage will increase. 4.If the gate is too big, excessive residual stress will be caused around the gate, leading to product deformation or cracks, and also it will not be easy to remove the gate. 1.Direct Gate: Melt enters the mold cavity directly through the sprue, suitable for shell-/box-shaped molds that feature a deep single cavity. With a short runner, it possesses the advantages of little pressure loss and convenient venting, but it is not easy to remove the gate, with noticeable marks left. 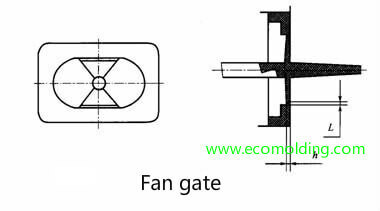 2.Fan Gate: The gate gets larger to become a fan shape from the runner to the mold cavity direction. This type of gate is suitable for the production of slender or flat and thin products, because it is able to reduce flow marks and directional stress. The angle of the fan is dependent on product shapes. 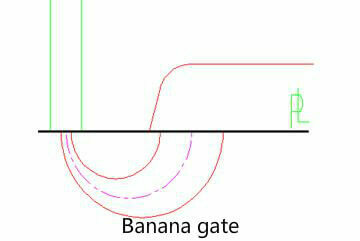 The cross sectional area of the gate cannot be larger than that of the runner. 3.Pin Point Gate: The type of gate that has a sectional area as small as that of a pin. 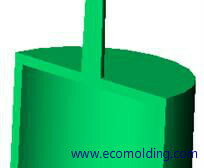 It is usually used for plastic materials that boast excellent fluidity. 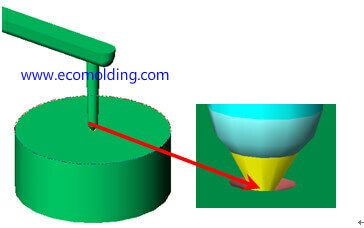 Normally, the length of the gate is no larger than its diameter, so the gate will be automatically cut off after mold release, making it unnecessary for additional trimming. It is widely used for the production of covers, housings and large-area products, thanks to the feature that there is no apparent gate mark. It allows the mold one more parting surface to make it easier for gate removal. The disadvantage is that the small size gate may lead to loss of pressure and cause some molding defects (flow marks, burnt marks and black spots, etc.). 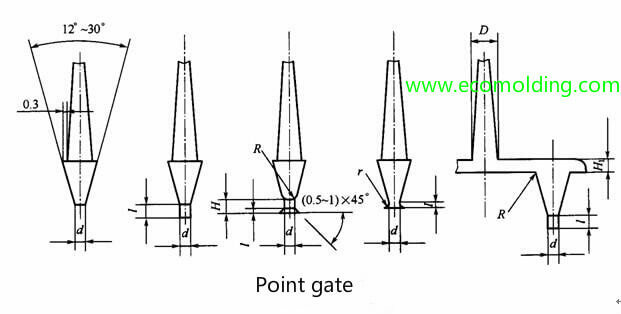 The shapes of pin point gate include diamond, single-point, double-point and multi-point, etc. It uses the three-plate mold, with a pore size of about 0.25 – 1.5mm. 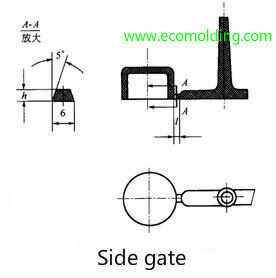 4.Side Gate: Usually located on one side of the mold. 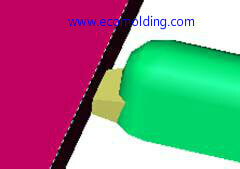 Material is fed in from the inside or outside of the parting surface. 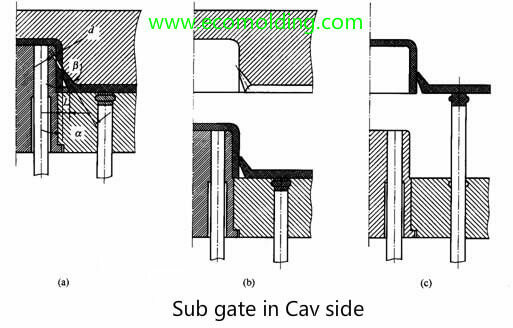 Often with a rectangular section, this type of gate is suitable for a multi-cavity mold. Usually trimmed manually, the gate thickness (a fixed thickness or a declining thickness) is about 50% – 75% of product thickness. 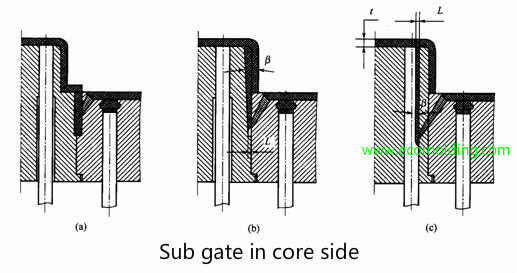 5.Sub Gate: This type of gate is usually inclined and lurks on one side of the parting surface. Material is fed in from product side or the inside. The pin sized gate will be cut off automatically during mold release, thus suitable for automatic production. The sub gates have several variations.